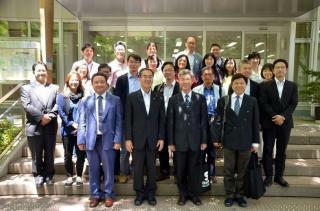 On June 1st, 2018, Professor Ta-shu Chiang (Vice President, Dean of Academic Affairs, and Director of Shui Sha Lian Research Center for Human Innovation and Social Practice of National Chi Nan University) and his party, total 17, visited Shinshu University to interact with President Kunihiro Hamada and the faculty staffs involved in the university’s local engagement project, COC (Center of Community). National Chi Nan University is located in Puli Township, Nantou County, the mid part of Taiwan. 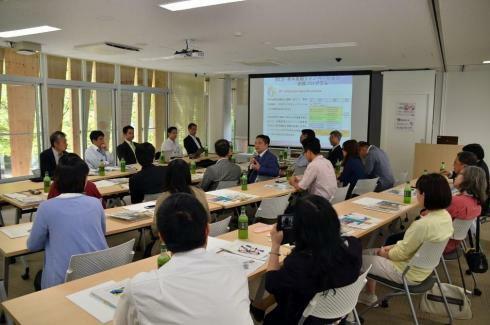 In Taiwan, "local governance through university's cooperation" has been more emphasized in its educational policy, and they selected Kanazawa University, Fukui University, and Shinshu University for a study tour for regional revitalization cases in Japan. The discussion was held at a seminar room in the newly built library, where a librarian made a small tour for the party before the session. In the session, Shinshu University side made a presentation about "promoting the Center of Community framework (COC project)" and "promoting the Local Revitalization based on the Center of Community (COC+ project)". Then Chi Nan University side introduced the activities of "Shui Sha Lian Research Center for Humanities Innovation and Social Practice" which is specialized in regional governance. The basic policy of the COC project is to promote a university’s local contribution to serve as a center of intellectual creative activities in the community using its various resources to resolve the underlying various issues for the community’s revitalization. Shinshu University offered an adult educational program "Professional Seminar" for the last four years and produced 210 Local Innovators to promote the regional contribution activities such as job creation, internship, and cultivation of capable employees, in cooperation with regional companies and municipalities. The participants asked a lot of questions each other and had meaningful discussions actively. "There are many similarities between our regional issues and the local issues at Shinshu University, and I feel that our efforts will progress further through the case of Shinshu University. I would like to introduce Shinshu University to our teaching staffs and students," Professor Chiang gave a closing address. "Beautiful mountain cherry blossoms will bloom in February, I hope you will come and see us." "Triggered by this visit, I expect we would like to continue good interactions," President Hamada said. 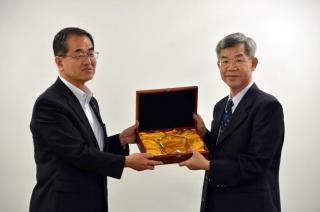 Shinshu University hopes to deepen the cooperation with Chi Nan University.